My summer has really just started. The girls have dance until mid June, which keeps us busy. And this year I took on their dance studio's annual dance concert photos, so that kept me very busy until just recently. I am finally slowing down on the photography side and ready to relax, not think about editing and maybe read a little. Also, I needed a really good book to accompany me to Alaska. Yes, a trip of a lifetime, my husband and I are taking next week. We are excited, nervous and so grateful to have been chosen! I hope to update while there, if not I will have SO many amazing photos to update when we return! I go through reading spurts. I may read four books in a month and then not read for another six months. If I find a series I love, like The Hunger Games, I will read until I'm finished and then be depressed and sad with nothing to read for a month. Here are a few books I have on my Good Reads Wish List, two I have read and encourage YOU to read if you have not. 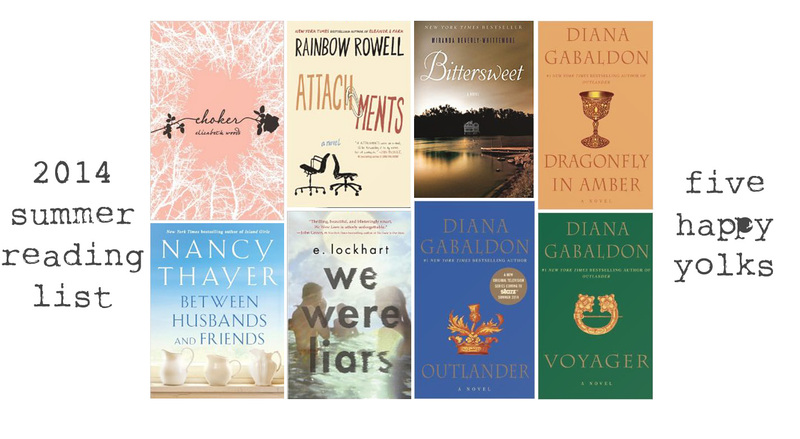 Outlander and Dragonfly in Amber. About two years ago a really good friend and someone whose opinion I value greatly suggested Outlander to me. I looked up the synopsis on Good Reads and thought, "eh... period book... time travel, NO.WAY" and I found something else. Finally I decided to check it out from the library. I devoured it in a month. It is a giant book, full of information. I am really picky with time periods when I read. I can read about the future, the present and even as far back as the 50's but to go way back into the 1700's, no. Well, that has all since changed. This book will pull you in, it is a story about love and time travel. The author has done such an amazing job with her historical facts as well, so you learn a little at the same time. I instantly fell in love with Jamie Fraser, the Scott that Claire (the main character) meets. The relationship they have will keep you reading and reading. And this summer, STARZ has joined with Diana Gabaldon, the author, to adapt it into a series. I am SO stinking excited to see it come to life in front of me. I hope it doesn't disappoint! So go out soon and get this book, Outlander is the first in the series. Dragon Fly In Amber is the second in the series. It follows them through time again. Here Claire plans to reveal a truth as stunning as the events that gave it birth: about the mystery of an ancient circle of standing stones ... about a love that transcends the boundaries of time ... and about James Fraser, a Scottish warrior whose gallantry once drew a young Claire from the security of her century to the dangers of his.... it, so far, was my favorite. I am only on the third book though, and have heard many say that the third book is their favorite, so stay tuned! Voyager I have had a difficult time getting into. I've checked it out THREE TIMES from our library, but I have a long flight ahead of me on Sunday and decided to give it another shot. The other books on my list are as follows, I have only read one of these but all of them appeal to me so they are in my "to read" on Good Reads. Are you on Good Reads? If so add me! It's a great site, you can keep track of what you want to read, read reviews and also keep track of what you have read! Lucy met Kate when they were both young wives and mothers. In the years since, the two women and their husbands and children have become inseparable, spending every August together in a house on Nantucket. Lucy and Kate, each other's most trusted confidantes, have shared their secrets, from the mundane to the shocking--but there's one explosive secret that Lucy has kept to herself. As August once again approaches, Lucy must confront the truth she has kept hidden all these years. Now, in the midst of an unexpected family crisis, she must make a decision that could shatter all of their lives. But as Mabel becomes an insider, she makes a terrible discovery, which leads to shocking violence and the revelation of the true source of the Winslows' fortune. Mabel must choose: either expose the ugliness surrounding her and face expulsion from paradise, or keep the family’s dark secrets and redefine what is good and what is evil, in the interest of what can be hers. So I hope that will prompt you to read a little this summer. Tell me, are you reading anything now? Comment and fill me in!